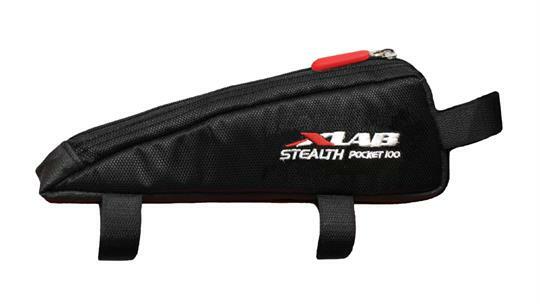 Wind tunnel testing and CFD analysis has proven that mounting an XLAB aero shaped bag behind the stem reduces the aerodynamic drag. Savings can be up to 2 minutes 15 seconds in a Full Distance race. - Actually reduces drag caused by stem and headset spacers. - Same width as head tube (Standard size bag), therefore no increase in frontal area. - 72 degree front fits tight up against stem. - Tapered aero design profile. - Super smooth low skin friction exterior reduces drag. - Non slip surfaces underneath and on front of bag grip top tube and back of stem. 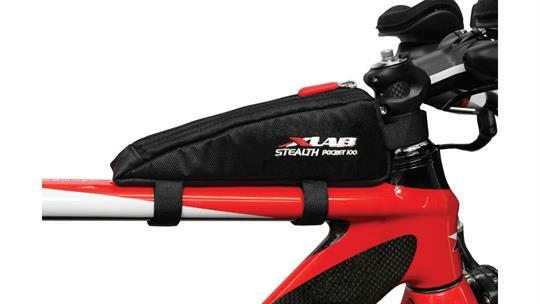 - Extra long front straps allow bag to be attached to bikes with cables entering the top tube behind the headset. - Located within easy reach while riding. - Non slip rubber zipper pull. - Can be mounted behind stem or seat post. - Silver colored interior makes it easier to see contents. - Stretch mesh pocket in contrasting red color for electrolyte tablets, salt tablets, cash or other small items. - Can store the longest energy bars. - Insulated sides keep your nutrition cooler. Material: Proprietary low skin friction woven material. Red stretch interior mesh. Reflective silver lining. Proprietary insulation material. Anti-slip base. High stitch count embroidery. Volume: 20.4 cu.in (334 c.cms).